There’s just something extra special about the comforting flavors of chai this time of the year. As the days continue to get darker and the constant threat of snow lingers this is the kind of breakfast I look forward to on these chilly mornings at the farm. As the granola slowly bakes, the kitchen fills up with so many wonderful scents of warming spices. This breakfast tastes perfect with a cup of hot coffee and some good quality creamy milk. Speaking of creamy milk, I’m excited to share with you all that Taylor and I joined a “herd share” for the winter. If you aren’t familiar, a herd share is sort of like a CSA only you get dairy instead of fruits and veggies. We joined a small local farm ‘Fair Food Farm‘ and will be receiving bi-weekly deliveries of raw, unpasteurized goat cheese, goat yogurt and goat milk. We could not be more stoked to continue and eat local food all winter long. If you’ve been reading this blog for a long time now than you already know how important supporting small farmers is to us. Taylor and I could not make a living doing what we love if it weren’t for our tribe of supporters joining our CSA, coming out weekly to the farmers market, or supporting the restaurants who support Tumbleweed Farm. We feel so grateful for the other farmers who grow/raise food that we don’t at our farm and being able to support them feels awesome! I’m going to play around with making goat milk butter, lattes, and creamy sauces. Stay tuned! 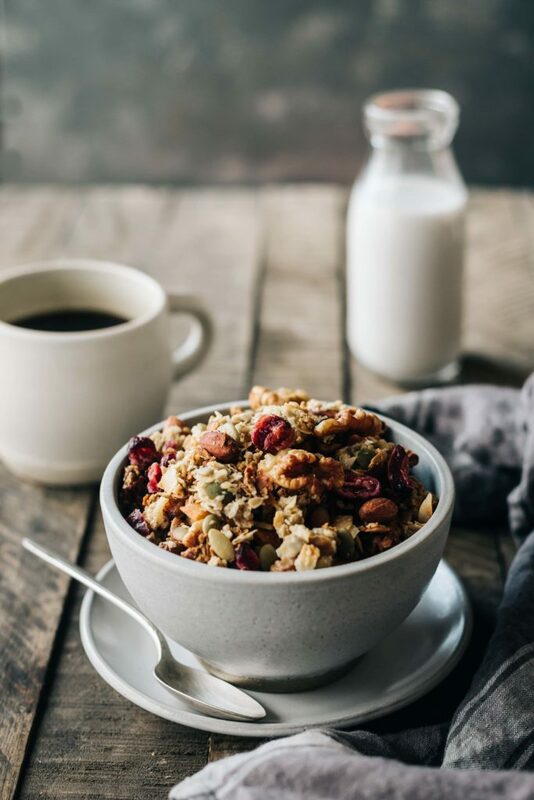 In the meantime though, it’s all about this sweet, spicy and crunchy granola. Pour a cup of coffee, grab a spoon and dig in. In a large bowl combine the oats, nuts, coconut, seeds, salt and spices. In a small bowl whisk together the honey, vanilla extract and olive oil. Pour the honey mixture into the large bowl with the oats and mix well with a wooden spoon. Spread the mixture evenly out on a large baking sheet. Bake for 15 minutes, then remove the pan from the oven and give it a good stir. Return the oats back to the oven and continue to bake until golden brown and crisp, about 10-15 minutes longer. Remove the granola from the oven and stir in the cranberries. Let the granola cool completely before storing in an airtight container for up to 2 weeks. So gorgeous! This is definitely a recipe that I need to try this season! Just made this and accidentally put the dried fruit in the mixture before baking. I picked half of it out and then got tired of doing it. So, some of the fruit was baked and it came out fine. This is a good recipe, thanks. Could I heat this with milk in the am for a nice warm breakfast? this recipe sounds amazing!! i think i am going to make a few batches and package them up for christmas gifts (with reference to your blog and cookbook). you have the perfect seasonal spices and colors going on here. i love that you found a dairy csa. i would love to find one in our area. any tips on finding a resource like this?